With concerns being raised regarding children on the street, Franzu Badenhorst (Director of Famsa Karoo) has made available the latest information regarding the drop-in centre where programmes are being followed to address the issue of children who roam the streets. The drop-in centre has been moved to another location and is now situated and fully operational at the Centre of Hope Building (next to the offices and workshop of APD) in the industrial area of Oudtshoorn. 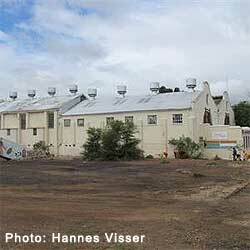 Badenhorst has undertaken to keep the public updated in regards to the upgrading of the facilities and services. Termites are the main diet of the aardwolf.